Viviscal Man hair growth supplements are clinically researched to nourish thinning hair among men and promote existing hair growth. * Viviscal Man is the #1 male hair growth supplement in the US.An estimated 40% of men have noticeable hair loss by age 35. Viviscal Man hair growth vitamins for men are scientifically formulated to reduce hair shedding and nourish thinning hair from within. Viviscal Man is backed by 25 years of continuous research and development. At the first signs of thinning at the temples, start taking Viviscal Man. Just 2 pills a day, morning and night, with water after food, and you could see thicker hair results in as little as 3 months. It's as simple as that.If your diet lacks specific essential nutrients for hair, including vitamins, minerals or proteins, it can affect the condition and strength of hair. Male Viviscal Man Full Force Fortifying Shampoo is the ultimate hair thickening shampoo for men. Full Force Shampoo makes hair look fuller with our exclusive thickening ingredient Ana:Tel and strengthens strands with the anti-breakage ingredient Keravis. Our proven formula nourishes the outside of hair with healthy hair ingredients including Biotin, Zinc and Keratin, while deep cleaning the hair and scalp to create the ideal environment for healthy hair growth. Full Force Fortifying Shampoo for men is good for daily use on all hair types, including dry, color-treated, fine or thin hair. Viviscal Man Shampoo contains no SLS, SLES, Parabens or Artificial Colors. 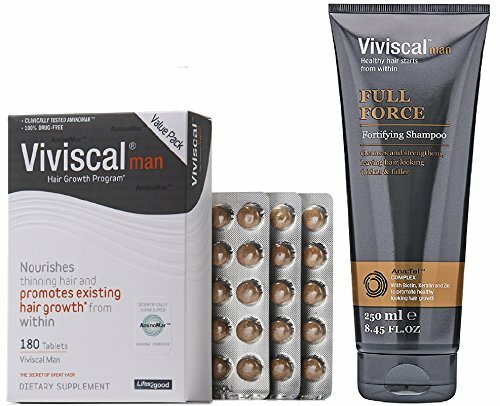 Use Viviscal Man Full Force Fortifying Shampoo as part of the complete three-part Viviscal hair care system for men, which gives you thicker looking hair from the inside and out. Take two tablets daily of Viviscal Man dietary supplement to promote existing hair growth from within. Plus, shampoo with Full Force for a deep clean that makes thin strands look thicker. Finally, comb in Conceal & Densify Volumizing Fibers to instantly cover thinning and make hair look thicker all day. Viviscal Man Full Force Fortifying Shampoo Cleanses and strengthens, leaving hair looking thicker & fuller. Blended with Biotin, Zinc and Keratin to promote healthy looking hair growth. If you have any questions about this product by Viviscal, contact us by completing and submitting the form below. If you are looking for a specif part number, please include it with your message.